100% cotton. 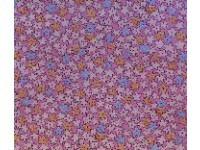 Cute little print, lilac/pink background tossed with little star-like white, gold and pale blue flowers. Windham Fabrics presents Storybook IV c. 1930.